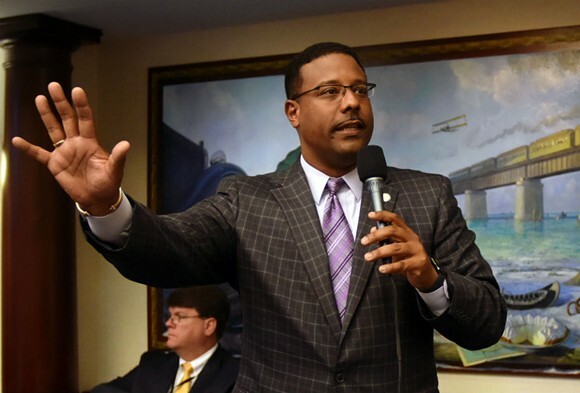 Earlier this month, Florida Democratic Attorney General candidate Sean Shaw promised to take action to curb gun violence on his first day in office if elected. Following another Florida mass shooting -- this time at a video game tournament in Jacksonville -- Shaw's pledge shows the importance of electing politicians who will no longer sit on their hands when it comes to gun violence. Declaring that “inaction is not an option” Democratic Attorney General candidate Sean Shaw said Thursday he’ll develop plans to combat gun violence on his first day in office. ...Under his plan, if elected, he’d set up the group his first day in office. The task force would be made up of Cabinet members, lawmakers, law enforcement officials, public defenders, mental health organizations, students, teachers and school officials. The group would return recommendations within 60 to 90 days, on topics including from the state’s preemption of local gun laws, 3-D printing of guns, the sale of assault-style weapons and school shootings. But Shaw already is eyeing some action on his own. He’d like to see the responsibility for reviewing background checks for concealed-carry permits moved from the Agriculture Commissioner’s office to the Florida Department of Law Enforcement. He also wants a repeal of the “stand your ground” law. Click here to learn more about Sean Shaw and how you can help.